One of the things about wearing multiple hats (rancher, writer, cook, bottlewasher, laundress, gardener, etc.) and being a blogger is that when you’re halfway through a project, it occurs to you that you should have grabbed the camera to record your activities for the blog. Since I’m usually going somewhere with tools already and my hands are full of things like shovels, fence pliers or buckets of chicken and pig food, the camera tends to be the last thing on my mind (I really need an official photographer clone to follow me around and record our doings). It’s probably not a good idea to leave the camera in the four-wheeler saddlebags — too hard on the camera in terms of moisture, temperature and general mayhem. On the other hand, if I leave it in the most readily accessible place (the kitchen counter right by the door) it’s quite likely to get doused with hot grease when hubby fries his breakfast eggs. All of this being a long-winded way of explaining why I don’t have on-the-spot pictures of a recent major project: planting new fruit trees. The labels, of course, are removed as soon as you map the tree locations in your garden book. 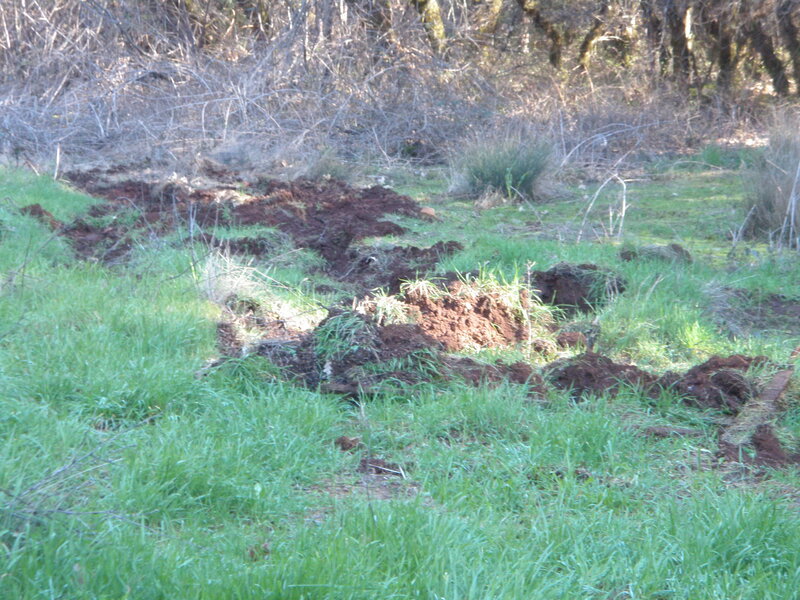 This ranch already has two long-neglected orchards we are gradually getting back into production. We are well-supplied with apple and pear trees, do okay in some years and poorly in others with plums and sour cherries, and nearly always have LOTS of wild blackberries. I’m gradually getting the strawberry patch built up. We also have a few outliers, such as the single Asian pear tree in the lower orchard, the fig tree in the house orchard, and the scattering of pear, wild plum and apple trees growing in random spots. What we were lacking was sweet cherries, peaches and mulberries, the last of which is one of hubby’s favorite fruits (chickens like them, too, which is why we planted that one next to the chicken pen). This was hubby’s “No, I won’t get the backhoe stuck, and even if I do, I can get out” spot. So this year, I bought three each of peaches and sweet cherries. 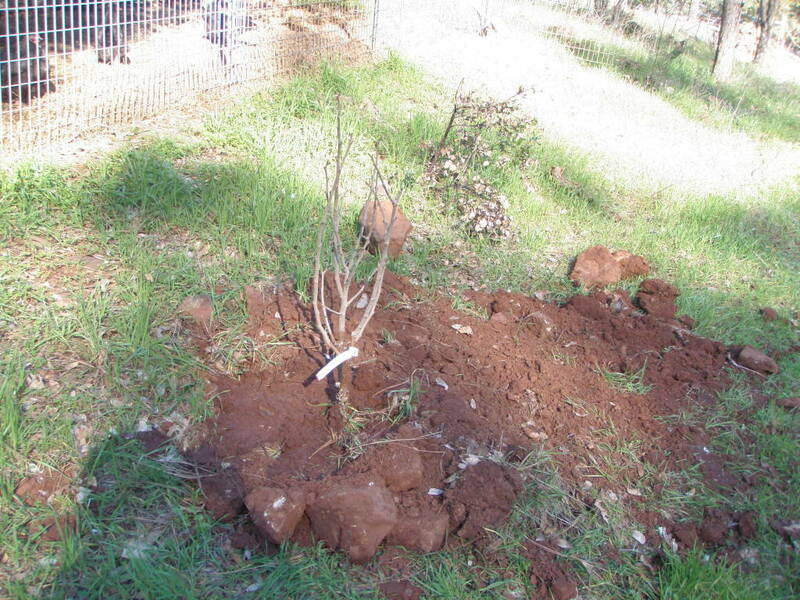 Planting bare root fruit trees is not a major production unless (as we do) you have lots of big rocks in your orchard. For that reason, we did the hole primarily with the backhoe and then did a little shovel work after removing the rocks from the planting holes. It’s not a good idea to add compost or soil in planting holes, because the transition zone between native soil and your amended soil can create a “clay pot,” limiting root growth. So it was basically a matter of dig a big hole (it is a good idea to loosen the soil around the root zone so the feeder roots don’t have to work as hard to expand into the soil), position the tree and shovel the dirt back in. Then we tamped the dirt by stomping on it. You also want to make sure you set the tree so the graft (fruit trees are nearly always grafted to a rootstock variety) is at least two inches above the soil line. If you cover the graft with soil, the odds are high that the rootstock will start sprouting. Last part of the process — water well. Even if the soil is already moist, watering helps settle the dirt around the roots. • Belle of Georgia Peach — Lewis A. Rumph introduced the Belle of Georgia in 1870. It’s named for Mrs. Belle Hall, mother of Mrs. J. N. Neel of Macon. Georgia Belle originated as a seedling of the old Chinese Cling peach. It’s a white freestone, very sweet and highly flavored. White peaches, by the way, are one of the exceptions to the general rule that deeply-colored fruits and veggies are more nutritious. • Indian Blood Cling Peach is a bit of an oddity among peaches. The skin tends to be tough, but is beautifully streaked with crimson. It’s a bit tart compared to most peaches, although it still tastes good for fresh eating. It apparently is a Spanish peach, but was introduced to Mexico in the sixteenth century. Within a century, it had spread clear to the east coast of what is now the United States . In other words, it’s one of the few peaches that will come pretty much true from seed. Thomas Jefferson was delighted to get some to plant at Monticello. • Rio Oso Gem Peach — developed in Rio Oso, California, and first mentioned in catalogs about 1926. It’s very pretty in bloom, with showy pink blossoms, and very tasty; aromatic, juicy and just the right blend of sweet and tart. It’s tender and bruises easily, like many of the old heirlooms, so you’re not likely to find it in a market because it can’t be shipped easily. • Bing Cherry — named for a Chinese orchard worker named Ah Bing, who managed the Oregon orchard where it was discovered and first grown, it’s been around since 1870. This is the classic sweet cherry — very dark mahogany-red, sweet and meaty. • Black Republican Cherry — this is one of Bing’s parents. It was first planted around 1860 by Seth Lewelling, a Quaker abolitionist who chose the name in honor of his beliefs. It has a complex flavor; people have described it as having rose, almond and herb notes. Cherries don’t usually come true from seed, but this one originally came from a seed of the Black Eagle Cherry and Bing came from a seed of Black Republican, so I’d say this one has more potential than most for promising seedlings. • Royal Ann/Napoleon Cherry — this is a real oldie, having been around since the 1700s. It’s prolific, large and tastes great; a yellow cherry that gradually ripens to red with a few yellow spots. • Black Mulberry — although they’re no good for silkworms, as the British found out to their dismay when the trees were imported in the early 1600s, they are good for eating. Technically a shrub — although older plants may grow 30 or 40 feet high — these are beloved by birds and small boys but hated by laundresses, as they stain quite badly. Not only are they good to eat, they may help lure the birds away from your cherries and peaches. Birds will spread the seeds quite nicely, so I expect we’ll soon have lots of them. We planted these February 14th. As of today, the Belle of Georgia, Black Republican (this one has multiple leaves all up and down the stem!) and Bing are starting to leaf out. Now I just have to wait about three years to get some fruit! 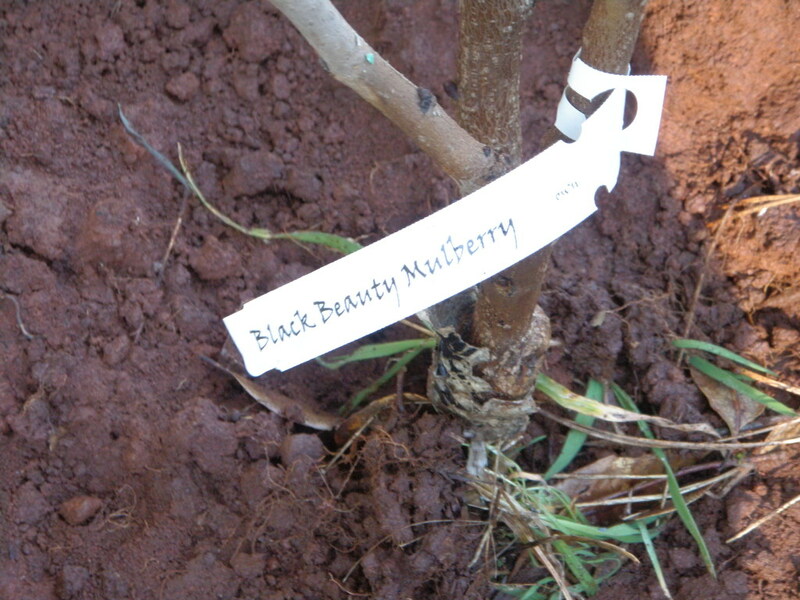 This entry was posted in Farms, Food, Health and tagged Belle of Georgia, Bing, Black Republican, cherry, fruit trees, Indian Blood Cling, mulberry, Napoleon, orchard, peach, Rio Oso Gem, Royal Ann. Bookmark the permalink.